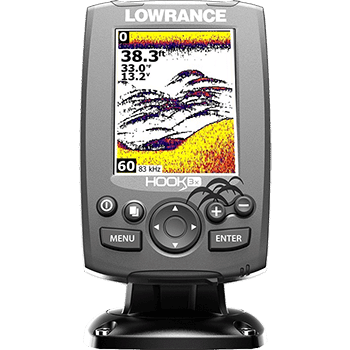 If you’re an angler and you love fishing by yourself or on a small boat, then you should really consider the Lowrance Hook series of fish finders. Made specifically for anglers, this fish finder is simple, easy to install and made to instantly get you to the fish. Some are even made to help you find fish under the ice. Today we’ll be comparing all of the major offerings in this series. That includes the Hook 3x, 4x, 4, 5 and 7, each with their own features and form factors. Starting off with the smallest model, the Hook 3x has a tiny form factor that makes it ideal for small places. While it’s small, the resolution is pretty good and the LED backlighting will ensure that you can easily see everything during the day and night. You get dual-frequency sonar that lets you choose between 83kHz and 200kHz. The 83kHz scan provides a 60-degree conical search that’s broad, while the 200kHz is a 20-degree cone that’s more detailed. You can switch between the two with the push of a button. 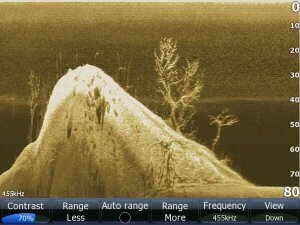 The ASP feature, common to many Lowrance models, reduces the need to adjust settings for clearer images and allows you to see bottom and structure details with ease. The Fish ID tool is interesting because instead of little arches, it makes them look like fish so it’s easier to visualize what’s around you. The maximum depth of this fish finder is around 300 feet in fresh water. It may be less in salt water or if there are inclement conditions. This should be fine for many bodies of water, but you may have trouble with deeper ones. Dedicated zoom buttons on the unit allow you to zoom in and out up to four times normal view so that you can easily zero in on areas that you’re interested in. All functionality is done through buttons on the unit, it is not a touch screen. 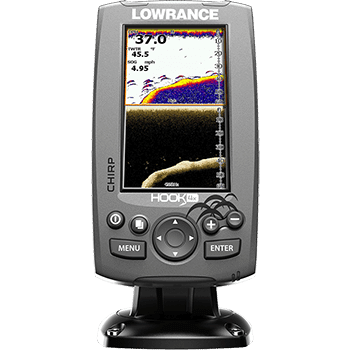 Overall, the Hook 3x model provides a fair number of features for a small unit and it’s perfect if you’re alone and just want a sonar to help guide you. It doesn’t have the power or extra features of other models, but it does a good job with what it has. Much like the 3x, this is a tiny unit for tight spaces that packs a good amount of power, but it does falter when it comes to GPS and more advanced imaging types. Perhaps the most unique feature is the ice transducer found in certain models (aptly named the Ice Machine). This allows you to scan deep under ice for fish. 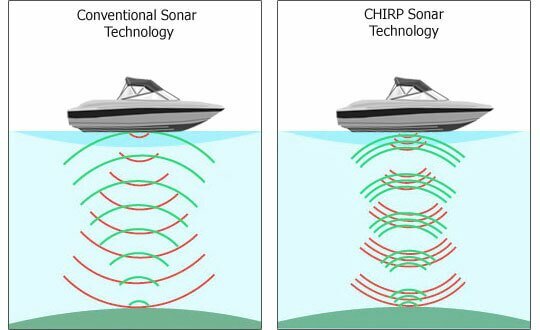 The two main imaging types here are CHIRP sonar and DownScan imaging. CHIRP is a technique that uses several frequencies at once to generate the best possible image in terms of distance and clarity. DownScan gives you a fish’s POV, showing you exactly what it looks like under the water. There’s also ASP to help reduce noise and distortion. There is also DownScan Overlay, which overlays the findings from your DownScan on top of the CHIRP or regular sonar. This can be used to better figure out what is beneath the surface and if it’s worth stopping for. 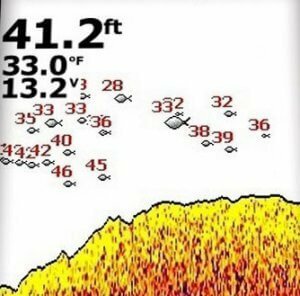 Trackback is a recording feature attached to the Lowrance Hook 4x’s sonar that allows you to keep track of your sonar findings. Everything is saved to the SD card (you are free to put in new ones for additional memory). You can scroll back through the sonar images so that you can study an area. This will help you discover new fishing spots. You can set the display to have three panels, which is great in larger models, but things feel a little cramped here due to the small size. It’s a nice feature to have, but you’ll likely set it to just one panel to maximize the space. The backlight here is fairly standard and helps you see the screen regardless of lighting conditions. One of the unique things about it is that the backlight is adjustable, ensuring that it won’t be too bright or dim. 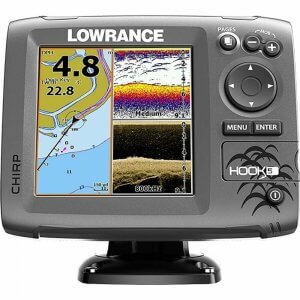 Overall, this is a good fish finder for the price. It’s affordable, able to fit in small spaces and has a few great features. It suffers from a smaller screen and fewer features that larger models. In general, it’s good for the price, but it lacks the power of larger models. 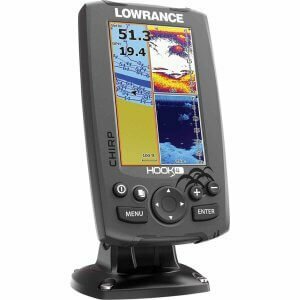 The Lowrance Hook 4 is very similar to the 4x. The only major difference is the inclusion of the GPS, but the ice transducer has been removed, so it matters which is better for your needs. Most would agree that the GPS is more important. The GPS connects to Insight Genesis, which allows you to download premade maps or generate your own based on your own scans and preferred waypoints. Due to the small size of the fish finder, you can only insert one SD card to save paths. 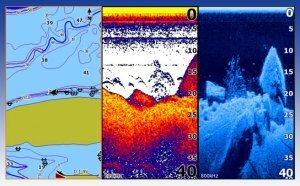 DownScan imaging shows you the what everything looks like under the water, giving you a good perspective on all of the fish, vegetation and other objects down there. You also get DownScan Overlay, which combines the DownScan with the CHIRP findings to give you the clearest imaging possible. Along with the Fish ID feature found with most Lowrance fish finders, you’ll have no problem discovering good fish to reel up. Switching between different frequencies is incredibly easy. Just push one of the “Page” buttons and the sonar will switch from one frequency to another, allowing you to change on the fly without going through complicated procedures or buttons. You can also view multiple image types at once by creating up to three panels, but you may want to stick to one or two considering the small size of the display. Speaking of the display, everything is in color to make all the objects and fish easy to visualize. 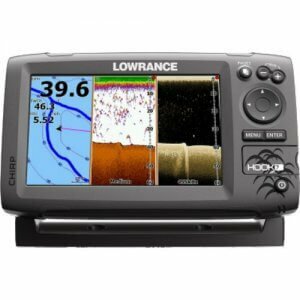 Overall, this is a good fish finder for the price. Some people might bemoan the lack of the ice transducer, but the inclusion of the GPS more than makes up for it. This is great if you’re going solo or have a small boat and just have a tiny space for a fish finder. 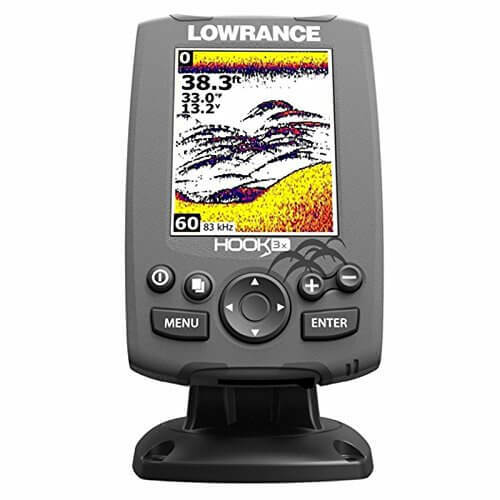 The Lowrance Hook 5 is a good middle point in the product line between affordability and power. The whole Hook line is based around simplicity, but this one gives a good amount of power that most fishermen will appreciate. It comes with a few imaging types, most notably DownScan and CHIRP. You get a maximum depth of 1,000 feet and you can switch between several different frequencies to get the best look while balancing clarity and distance. Switching frequencies is as easy as pushing a button, and the buttons are especially good with this model. Though the display itself is just one inch larger than the 4 and 4x, the unit itself is considerably wider. This is because new, upgraded buttons have been added to the righthand side. These buttons are easy to push, making it simple to select settings, change between frequencies and setup your multiple panels. You are able to create up to three panels at once to show different imaging types. Since the screen is larger, you should have no problem using all three panels and easily being able to see all the information. There is also information on the screen about water temperature, current speed and several other important metrics. The GPS is quite good here. It comes preloaded with 3,000 lakes and you can easily use Genesis to generate new maps. Feel free to load a microSD card into the fish finder to upgrade the program and add even more maps and paths. You can also set alarms based on position, depth, water temperature and so on. Perhaps the only bad thing is that the Hook 5 doesn’t last too long on batteries. It drains faster than the 4 and 4x, so have spare batteries ready if you’re out on a longer fishing trip. 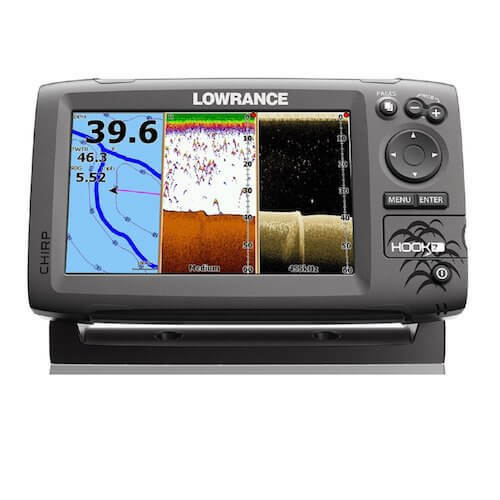 Otherwise, this is a great fish finder to have around. It’s got a good, bright screen, multiple imaging types, a respectable GPS and it has everything you need to help find a good fishing spot. 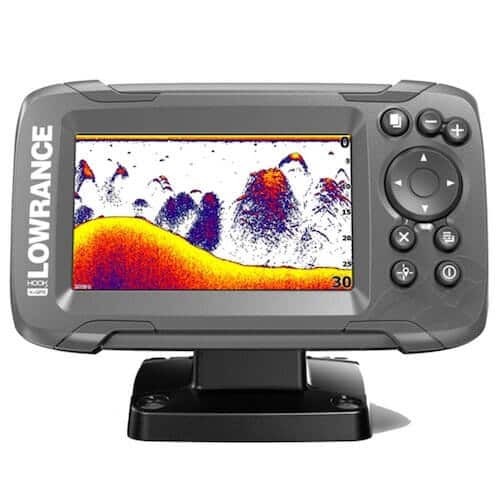 The Lowrance Hook 7 is very similar to the Hook 5, as you can see from the specs. There are a few differences here, like the better depth with the low-range sonar and the larger screen, but overall it basically a larger version of the Hook 5. It even has the same buttons and overall layout, it’s just a little taller and wider to accommodate the bigger screen. Now, having a bigger screen does present a few benefits. First of all, the multiview panels are much easier to see, ensuring that you can clearly see all the information on there. Not only that, but you can appreciate the 16-bit color here since the images are so much clearer. Aside from the good screen, you also get several types of imaging, notably traditional sonar, CHIRP sonar and DownScan. There’s also DownScan Overlay that overlays the DownScan findings on top of your sonar scans, ensuring that you can easily compare the two. TrackBack allows you to roll back sonar images to help you study an area for changes. The GPS here is great, and it allows you to store up to 3,000 waypoints and 100 routes, on top of the 3,000 lakes already preloaded in there. Just like the Hook 5, you can upload and download maps through the use of a microSD card. The buttons and interface are very easy to use, even a little easier than the Hook 5 because they are slightly bigger. This allows you to very quickly switch between views and activate other tools with only one hand. Within a few button pushes you should be able to find what you want or activate the tool that you need. Overall, this is a good fish finder that gives you all the basics. It truly fulfills the promise of simplicity by giving you all the tools you need along with an easy-to-use interface and a good screen. While you get most of the same benefits with the Hook 5, the larger screen truly is worth the higher price tag.